Children will love making these delicious cupcakes. Scroll down to find out how to top them with petrifying pumpkin faces, creepy crawlies, and cute spooks too! 1. Preheat the oven to 180°C, gas mark 4. Line 18 sections of 2 x 12-hole cake trays with fairy cake cases (or bake in 2 batches). 2. Dice the pumpkin and cook in boiling water for 15 minutes until tender. Drain thoroughly and return to the saucepan. Mash well. Sandwich between plenty of sheets of kitchen paper and press down firmly so the paper absorbs the moisture. 3. Put the ginger, butter, sugar, eggs, flour and baking powder in a mixing bowl and beat with an electric whisk until smooth and creamy. Beat in the pumpkin purée and sultanas briefly to mix. 4. Spoon into the cases, filling them three- quarters full, then bake for 20 minutes until risen and springy to the touch. Transfer to a wire rack to cool before decorating. 1. Cook 250g sliced carrots in boiling water for 20 minutes or until very soft. Drain well, cool, then blend to a smooth purée. Add 125g softened butter, 175g icing sugar and 1 tsp lemon juice and blend until smooth. Add extra icing sugar if the mixture splits and continue to blend. Spoon into a Cooks’ Homebaking Piping Bag, cut off a 2.5cm tip and pipe 1cm-thick lines back and forth across each cupcake. 2. Cut small pieces of kiwi fruit to resemble stalks and push into the tops. Cut slices of skin from large black grapes, cut out zigzag mouth shapes from these and push gently into the cupcakes. Add triangles of grape skin for eyes and noses. 1. Peel, core and dice 2 small cooking apples and put in a pan with 11⁄2 tsp lemon juice. Cover and cook gently for 8–10 minutes or until the apple is very soft, giving it an occasional stir. 2. Mash well, tip into a bowl and leave to cool. Add 375g creamy soft cheese, 75g icing sugar and 75g soft butter. Whisk until smooth and chill for an hour to firm up. Spoon into a Cooks’ Homebaking Piping Bag, in batches if necessary, and cut off a 3.5cm tip. 3. Pipe swirls of frosting onto each cupcake, trailing off to a point at the top. Cut ovals of blueberry skin for eyes. 1. Beat a 250g tub creamy soft cheese in a bowl with 50g icing sugar and a little green food colouring. Spread over the cakes. 2. Melt 50g milk or plain chocolate and pour into a Cooks’ Homebaking Piping Bag. 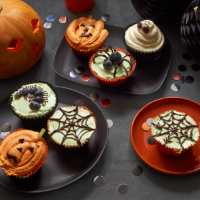 Cut off the smallest tip possible and pipe fine lines to draw spider’s webs over a third of the cakes. For spiders, press a red or black grape with a blueberry in front into half the remaining cakes. 3. Cut 3cm lengths of liquorice Catherine wheels and cut these into fine strips to make legs. Pipe dots of chocolate for eyes. Make centipedes for the remaining cakes by halving small blueberries and arranging them in a curved line. Add a larger blueberry half for heads, a pointed piece for tails, and pipe chocolate legs and eyes. This recipe was first published in Tue Aug 19 15:56:00 BST 2014.